This is a quality tool set with 3 screwdrivers, and one extra push drill included, plus the standard accessories. The box is marked "NORTH BROTHERS MFG. CO. YANKEE PHILADELPHIA PA. U.S.A." on the partial black and gold label on the top inside of the nice oak box. The label on the top outside of the wooden box is in about 70% intact condition, some of the remaining label is a bit fragile. 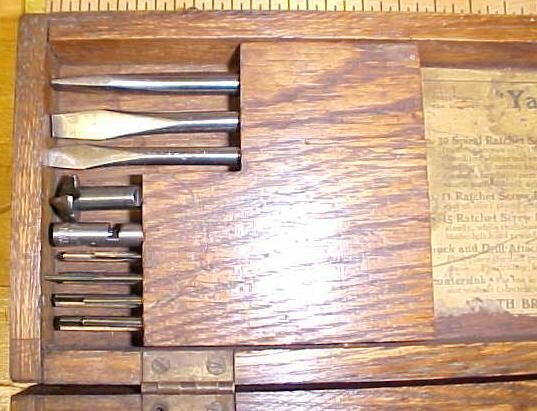 There is another marked noted on the inside label that reads "YANKEE TOOL SET NO. 100" and an inventory list of "NO. 30 SPIRAL RATCHET SCREW DRIVER, NO. 11 RATCHET SCREW DRIVER, NO. 15 RATCHET SCREW DRIVER, CHUCK AND DRILL ATTACHMENT, COUNTERSINK". The set is complete according to the list, accept for the No. 15 screwdriver is a No. 15A screwdriver made by Stanley England, and the No. 10 is replace by a newer No. 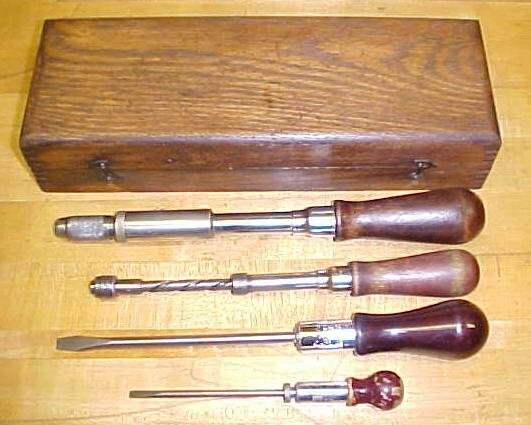 10A also made in England, both are basically the same tools that North Brothers had in these set originally, and fits into the box, and the chuck is the correct size to hold the drill adapters, countersink, and the screwdriver tips. The No. 10A is near like new condition, very crisp and clean, appears to have never been used. Marked "STANLEY NO. 10A STANLEY TOOLS SHEFFIELD ENGLAND". The No. 15A is in very good condition, about 99% like new on the steel, as you can see, some of the thick rosewood stain has come off, otherwise the wood handle is very nice. The 15A is marked "STANLEY NO. 15A STANLEY TOOLS SHEFFIELD ENGLAND". The No. 30 is in good condition with about 80% nickel plating intact, and about 50% handle finish intact, works great. We note a small ding on the nickel plated handle ferrule, not bad, the spiral ratchet system works smoothly. This one is marked "YANKEE NO. 30 NORTH BROS. MFG. CO. PHILA PA. U.S.A. PAT.NOV.3.08" and some other earlier patents also. All screwdriver handles are well attached, no cracks. The No. 30 can be used as a spiral drill as this set includes a 8 drill point set plus the adapter so that the smaller diameter drill points will fit in the screwdriver chuck, via the adapter. There is also a countersink and three screwdriver tips provided, all for the No.30 all in good++ to new condition. 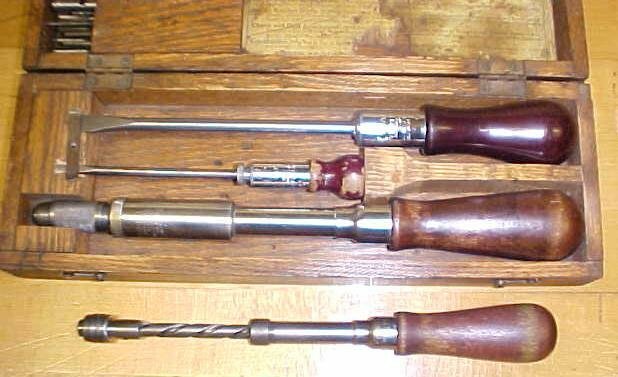 We are also including a rare early North Brothers push drill with a hardwood handle, since the set included 8 drill points that fit right into the screw type chuck on the push drill. The push drill will not fit into the oak box, but is included. The push drill is marked "YANKEE NO. 42 NORTH BROS. MFG. CO. PHILA PA. U.S.A. PAT.OCT.9.00" and a few other earleir patent dates also. The push drill is in Good++ condition, and very solid hardwood handle with some rosewood stain still intact, no cracks, the spiral drive system works great. It measures about 10" long, and is better suited for drilling small holes than the No. 30 screwdriver, so we included it with the No. 100 set. The oak box is custom factory made, very nice wood, good hardware, and corner box joints, and rounded corners on the top. The wood case measures 4.2 x 12.2" long, has some minor finish wear, not cracked, nice grain, good hinges and latches. 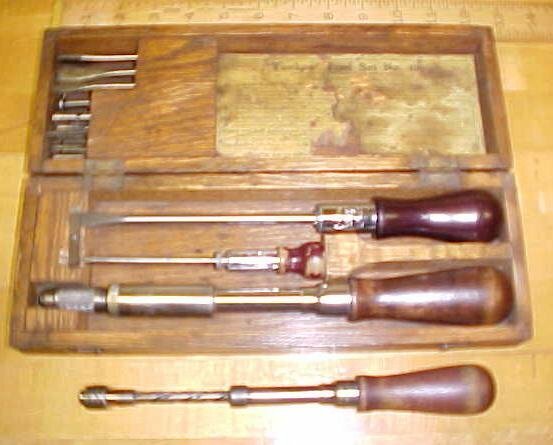 A very nice set with a nice antique push drill included! Items Similar To "North Bros. YANKEE Tool Set 100 Screwdriver Drill Box & More"